Pictured, from left, are Lynchburg-Clay Elementary School first grade teacher Heather Carraher, Principal Angela Godby and fourth grade teacher Kelly Woods. Editor’s Note — This is the fourth in a five-part series showcasing each of the five Highland County public school districts from a teacher’s perspective as they kick off another school year. What will the world be like in 2026 and 2030? For Kelly Woods and Heather Carraher’s students at Lynchburg-Clay Elementary, it will be the year they graduate from high school. Angela Godby is in her second year as principal at the elementary school, though she’s been an educator for 21 years. Lynchburg-Clay Elementary has grades pre-K through fifth, and Godby’s goal with the new school year is to see students learning in a confident environment. It’s an attitude reflected by Carraher, who teaches first grade and is in her 13th year. Carraher started teaching because she loved working with children, and while at college she worked at a child care center. That love for teaching is shared by fourth grade teacher Wood, who has been at Lynchburg-Clay for 22 years. “I loved school and had really good teachers growing up, and I’ve wanted to be a teacher since I was a little girl,” she said. Woods’ fourth grade class has is required to complete state testing, which can be intimidating at times. As an administrator, Godby agrees with Woods’ philosophy. Gone are the days of memorizing facts, figures and dates. “We get more into the ‘why’ and ‘what happened,’ what was the motivation behind the event,” Woods noted. There are many challenges facing students in today’s world and the Lynchburg-Clay school district is no different. Godby added that between video games and social media, it’s sometimes more than their young minds can handle. “Something as simple as a child making a gun with their thumb and index finger, in today’s school environment we just don’t tolerate it anymore,” she said. Something else that isn’t tolerated is the foul language freely used in today’s society, and it’s trickled down to her elementary students. Another big concern, especially for a rural district like Lynchburg-Clay, is keeping up with advancing technology. It’s a problem that is prevalent in smaller, rural districts across the country. Carraher said that there is Wi-Fi Internet in Buford, but just three miles away at her home, the Internet genie is still in the bottle. Technology aside, another issue that concerns all three educators is students that show up for class unprepared — and it is not the kids’ fault. Lynchburg-Clay has attacked that problem with its Ready Fest project, a community-funded program that helps students get prepared before school starts. Every student, regardless of income, can sign up and get clothing, supplies, a backpack and used books. The program even provides laundry detergent and hygiene supplies. “The whole idea is for the kids to come to school ready,” Godby said. Getting and keeping the student prepared as the school year gets underway should be a partnership between the parents and teachers. Woods recommended establishing good routines at home as the school year starts. “Your little ones are learning how to play together and share, and then you have Kelly’s fourth and fifth graders trying to fit in, and having their first crushes in the process,” Carraher said. Godby had the following advice for parents at the start of the school year. 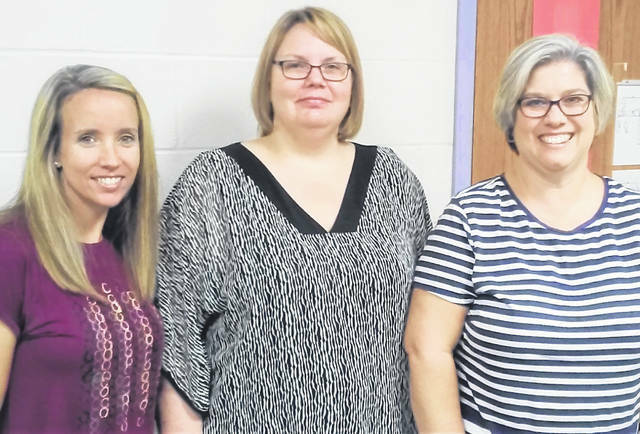 https://www.timesgazette.com/wp-content/uploads/sites/33/2018/08/web1_Carraher-Godby-Woods-1.jpgPictured, from left, are Lynchburg-Clay Elementary School first grade teacher Heather Carraher, Principal Angela Godby and fourth grade teacher Kelly Woods. This entry was tagged Lynhcburg, parents, school, students, teachers. Bookmark the permalink.